After a long week of hardwork, who wouldn’t want to de-stress and relax? I heard about Nuat Thai Foot & Body Massage from my friends and relatives all claiming that is one of the best massage parlors in town, so me and my boyfriend decided to try their service for the first time. 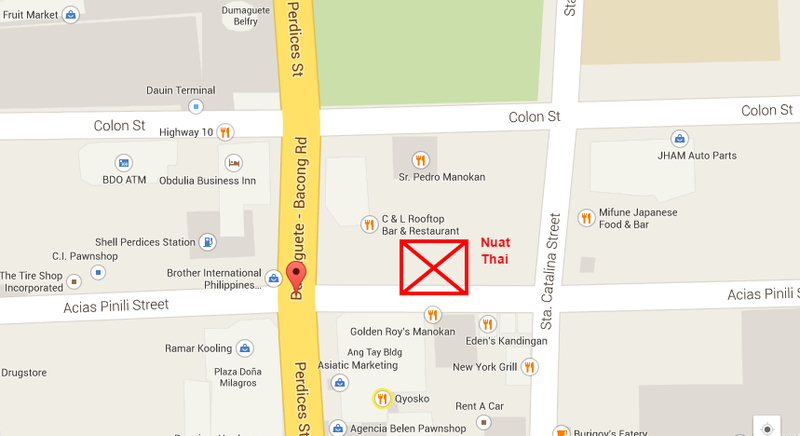 Nuat Thai Foot & Body Massage is conveniently located at Pinili Street, Dumaguete City (see map below). We entered and approached the receptionist. The area is quite small but it was clean and well maintained. They offer a wide variety of services such as Thai, Swedish, or back massage and we opted for a Combination of Swedish and Yoga Massage for only 230 pesos for an hour. We were escorted to an area where they prep us by soaking our feet with hot water for like 15 mins and then led us upstairs to our room. The room was perfectly dimmed providing us this relaxing ambiance. There were two floor beds (as we opted for a couple room) with super clean and fresh smelling sheets which is a plus because I am very particular with this. My masseuse was friendly and very professional. She was gentle on me after I told her about my back condition(scoliosis). The combination of Swedish and Yoga massage felt so great that it made me so sleepy. After the massage which lasted for a hour, they asked us if we want to be served with tea, we said yes and they served it downstairs. The whole massage experience was perfect and worth the price. We were happy with their service and were impressed with their professionalism in handling clients. I highly recommend Nuat Thai to those looking for great quality and affordable massage service. Surely, we will be back to try their other services. Join in the bandwagon. Have fun!